This month, we feature Canadian Bar Association, BC Branch, a Clicklaw contributor. CBABC is the provincial division of the Canadian Bar Association (CBA). The CBA is a professional, voluntary organization representing 38,000 lawyers, judges, Quebec notaries, law teachers, and law students from across Canada. More than 6,700 are members of the BC Branch. CBABC operates the Dial-A-Law service. Law Week 2018 is fast approaching and the Canadian Bar Association’s BC Branch is looking forward to celebrating the signing of Canada’s Charter of Rights and Freedoms during the week of April 16-22, 2018. 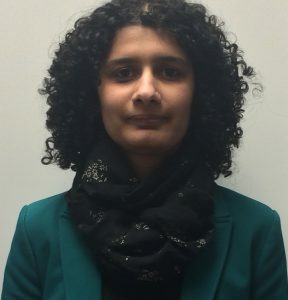 Originated by the Canadian Bar Association and first held in Canada in 1983, Law Week provides an excellent opportunity for the legal profession to educate the public about the vital role that lawyers and the judiciary serve in guaranteeing an open, independent and unbiased judicial system. Law Week events are held in communities throughout British Columbia during the month of April and into May this year and are made possible through the efforts of lawyers who donate thousands of hours of volunteer time across Canada. 2018 Events include: courthouse tours, free public law classes, Dial-A-Lawyer Day, The Barry Sullivan Law Cup, Meet the Chiefs student forum, and Judges in the Classroom. 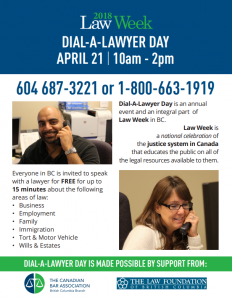 Dial-A-Lawyer Day is an annual event and an integral part of Law Week in BC. British Columbians are invited to speak with a lawyer for up to 15 minutes at no cost about the following areas of law: Business, Employment, Family, Immigration, Tort & Motor Vehicle, and Wills & Estates. Last year, a staggering 325 calls were answered by a group of 20 volunteer lawyers who provided the public with this very valuable service. Law Week is a collaborative project organized through the partnership of the BC Branch of the Canadian Bar Association, the Continuing Legal Education Society of British Columbia, the Law Foundation of British Columbia, the Law Society of British Columbia, the Vancouver Bar Association, and the Trial Lawyers Association of BC. To find out more information about Law Week and how you can participate, visit the Law Week website. Earlier this year, CBABC announced the launch of the new BC Legal Directory. After 30 years in print, the publication is now a purely online experience optimized for mobile devices and fully accessible to the public for the first time. The BC Legal Directory is the most comprehensive listing of BC lawyers, including private practice, corporate counsel and government lawyers. The directory also includes the judiciary, paralegals, notaries and law-related groups such as law schools and local bar associations. Lawyer profiles are searchable by name, location, languages spoken and areas of practice. The directory offers more robust profiles and wider exposure for legal professionals, along with the capacity to update a profile at any time.